Céline Condorelli, Tacita Dean, Douglas Gordon, Barbara Holub, Hannah James, Grace Ndiritu, Lilly Reich, Erik Satie, Ines Schaber, Albrecht Schäfer. Curated by Céline Condorelli & Gavin Wade Launch: 6-9pm Friday 12th March 2010 13 March  17 April 2010 BLIND - We have many things in common. We organize the relationship between inside and outside. SILK - (dismissive) The old myth of inside and outside. Thereby I am a scheme for a space and you an attribute of it. In my case however, it is about structure; more than separating, it is about creating a new space. Curtain Show revolves around the phenomena of German Designer Lilly Reich's Silk and Velvet Café at the Women's Fashion Exhibition, Berlin in 1927. The trade fairs of the 19th century and early 20th century were places of great innovation in the fields of art and design and Reich's âCafé' was an exceptional example. Reich's bold exposition of gold, silver, black and lemon-yellow silk and black, orange and red velvet draped over chromed-steel tubular frames created a maze of spaces in which viewers and traders were enveloped by opulent walls of rich fabrics. The Silk and Velvet Café is a pioneering example of a temporary environment formed by the content of the exhibition, both exhibition design and product creating convivial space. Starting from the installation's complex spatial position and ambiguous German politics, Curtain Show extends this dual-role as curtain forms occupy background and foreground in a âmeeting' of curtain works. A curtain may serve to separate or create space and to articulate its boundaries; it indicates a change of function and visibility  for example from public to private, and from day to night. A curtain can regulate light or temperature, but it also has an amorphous quality that makes it messy. It is also the most repressed element of architecture, and is often overlooked or taken for granted, or altogether banned from buildings, as for example in the Economist Plaza by Alison and Peter Smithson. A curtain is practical and yet considered ornamental, formless yet spatially transformative, it can easily be folded and transported, and has no presence without its support. Curtains are fragile, and occupy a fragile territory, between painting and architecture, and between the decorative and the essential. Originally made for Berlin's now closed airport Tempelhof, Ines Schaber's Diabolic Tenant deals with the related power of politics and design, through the collaboration between Lilly Reich and Mies Van der Rohe, interrupted in 1937 when the Nazi's took control of a German textile exhibition in Berlin. By 1944 their entire archives had been burned. In Diabolic Tenant, two curtains, Silk and Blind, speak, through their relative position and the politics they embody, and their dialogue unfolds the very different possibilities for understanding their function and the role of design in society. For Grace Ndiritu's Still Life, 2007, a large curtained area is formed from West African fabrics courtesy of Holland, fabricated in China and available in Birmingham's rag market. Ndiritu's series ofàÂ four videos use West African textiles in a sensual and, at times, unnerving physical performance by the artist to the camera. Ndiritu wraps, conceals and reveals her body, creating and controlling tensions within the fabric to provoke an array of emotional states. Tacita Dean's 16mm film Darmstädter Werkblock, 2007, was filmed in the rooms that make up âBlock Beuys' in Darmstadt's Hessisches Landesmuseum. The installation of objects and vitrines was composed and reordered by Joseph Beuys from its establishment in 1970 until his death in 1986. The museum wanted to renovate the galleries for some time because the jute walls (a leftover from the pre-Beuys medieval galleries) were badly patched and stained. 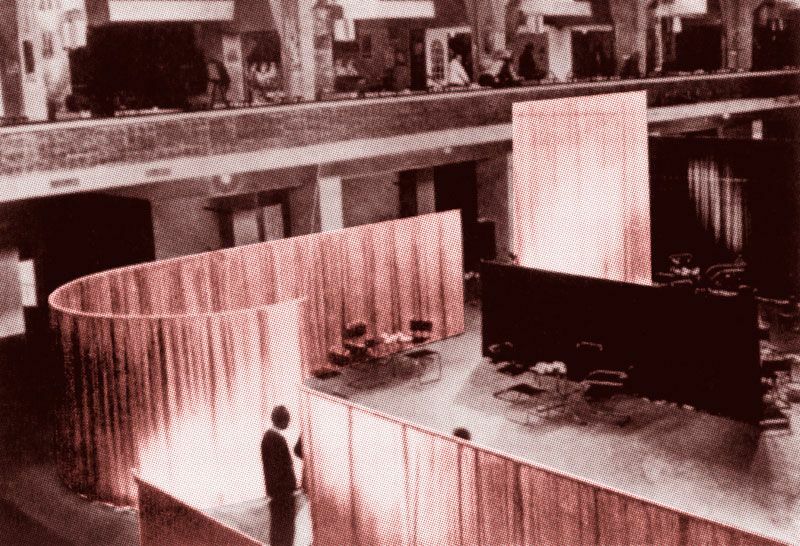 This decision upset many who believe the walls add a very particular and unique atmosphere to Beuys's installation. The controversy lies in the fact that Beuys never made particular reference to the walls so making them impertinent to any renovation question. Dean's film entirely concentrates on the soon to be replaced walls, carpet and details of the gallery décor, seeing them as analogous to the entropy in and of Beuys's art, whilst carefully avoiding any sighting of the work itself. Off Screen is a 1998 video installation by Scottish artist Douglas Gordon in which the image of a curtain is projected on to a screen that is, in itself, a curtain. The audience passes through the projection and curtain becoming active as they form silhouettes of characters 'off screen' visible to the audience on the other side of the curtain. Gordon highlights the idea of the off-screen being as interesting, if not more so, than what is happening right in front of you. This connects with the idea of the gallery in general and Eastside Projects in particular as a sequence of areas interlinked, with different functions and values, propelling differing sets of performances heightened within Curtain Show. Berlin based Albrecht Schäfer recreates an aluminium curtain wall façade from a prominent building in Berlin's central Alexanderplatz. Centrum 1998/2010 is a paper version of the façade of the former Centrum department store based on an original design by Egon Eiermann at the end of the 50s for the chain of Horten department stores, which were a trademark in all West German Cities. When Alexanderplatz was being redesigned in the style of International Modernism at the end of the 60s, Centrum, the biggest department store in the GDR, incorporated a variation of the Eiermann façade, thus imitating Western capitalism. After the fall of the wall the shop Kaufhof acquired the Horten chain and also took over the East German copy of their own Western identity. The original Horten curtain wall pattern is presented on the indoor billboard for Curtain Show viewed through the filter of Centrum. Bristol based Hannah James has been producing a series of delicate printed paper screens, site specific hinged shutters and curious freestanding wood, paper and twine structures supporting small flags or curtains. For Curtain Show James will develop two new works in response to and inhabiting the overall scaffolding system used to support a number of the curtain works. Vienna based Barbara Holub's long term work at Eastide Projects, Initiative Island, 2008, will be moving across the gallery from its position in Gallery 2 to perform a new function in the main space of creating a room for Erik Satie's musique d'ameublement (Furniture Music), 1917, specifically made to be played with curtains. During Curtain Show Céline Condorelli will also be reconsidering curtains as a way to footnote buildings during a residency at Grizedale Arts in the Lake District. Condorelli will present parts of her process for Grizedale's buildings across the duration of Curtain Show - as things considered unessential (as in Wen Zhenhengâs Treatise of Superfluous Things, 1620), and therefore provide pointers in how to behave in society, and how to read a public or domestic environment. âWhat's so political about chiffons?' Mies Van Der Rohe, 1935 Eastside Projects 86 Heath Mill Lane, Birmingham, B9 4AR, UK Contact 0121-771-1778 info@eastsideprojects.org www.eastsideprojects.org Free Entry: Open Thursday 12-6.30pm, Friday to Sunday 12-5pm Eastside Projects is a not for profit company Limited by guarantee reg: 6402007, in partnership with Birmingham City University and Revenue Funded by Arts Council England West Midlands. Extra thanks to Gregory Sporton and CFAR at BIAD, Birmingham City University; Adam Sutherland and Alistair Hudson at Grizedale Arts.